Abstractions infused with an innate connection with the light and color of his Egypt, best describe the unique nonrepresentational style of Farouk Hosny. After living in Paris and in Rome, his paintings began speaking the language of the modern world. 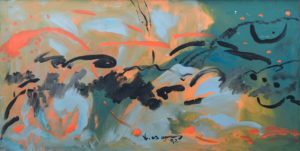 Through his use of abstraction he transformed the representations of his native country into calligraphic gestures using vivid colors evocative of the Egyptian landscape. For Hosny, the blacks became the sudden nightfall, the blues the sea water, the whites the limestone, the violets the Sinai mountain range, the burning ochres the desert, the greens the flowing Nile, the grays the ancient stones, and the oranges the flaming sunsets.